This post is sponsored by Valpak, but all opinions are 100% my own and may differ from yours. I will only endorse companies (like those that support breast cancer research), products and services that I believe, based on my own experiences, are worthy of endorsement. I bet you would be hard-pressed to find anyone nowadays that isn’t affected by breast cancer. Either you, yourself, have or had breast cancer or someone you know and love has or had breast cancer. 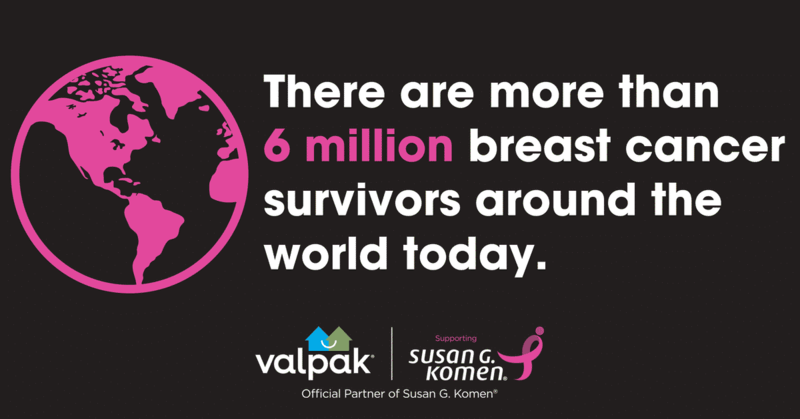 When I heard that Valpak was joining up with Susan G. Komen in the fight against breast cancer, I was thrilled. This October, Valpak will turn its blue envelopes pink for Breast Cancer Awareness Month. 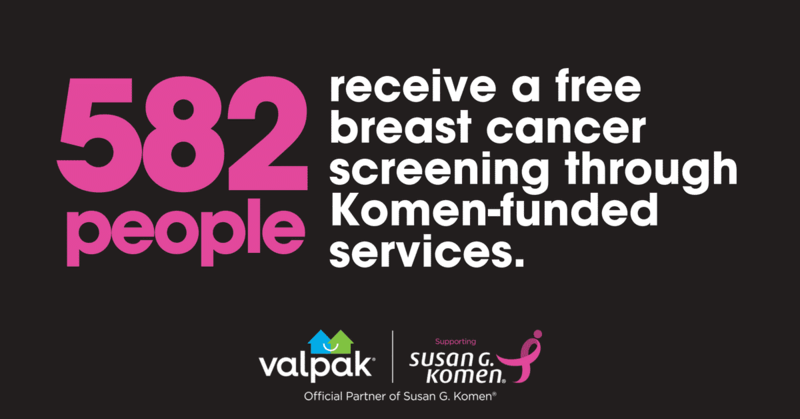 In 2018, Valpak will donate at least $50,000 to Susan G. Komen while encouraging donations and support activations through other local and corporate partners. That’s impressive to me. And you can help by signing up for your local Susan G. Komen Race for the Cure. It’s a great way to support breast cancer awareness and education. The Race for the Cure is also a great way to honor those who have lost their battle with this disease and celebrate those who are survivors. My local Race for the Cure in Knoxville, TN this year is on October 27th, so there’s still time to register. 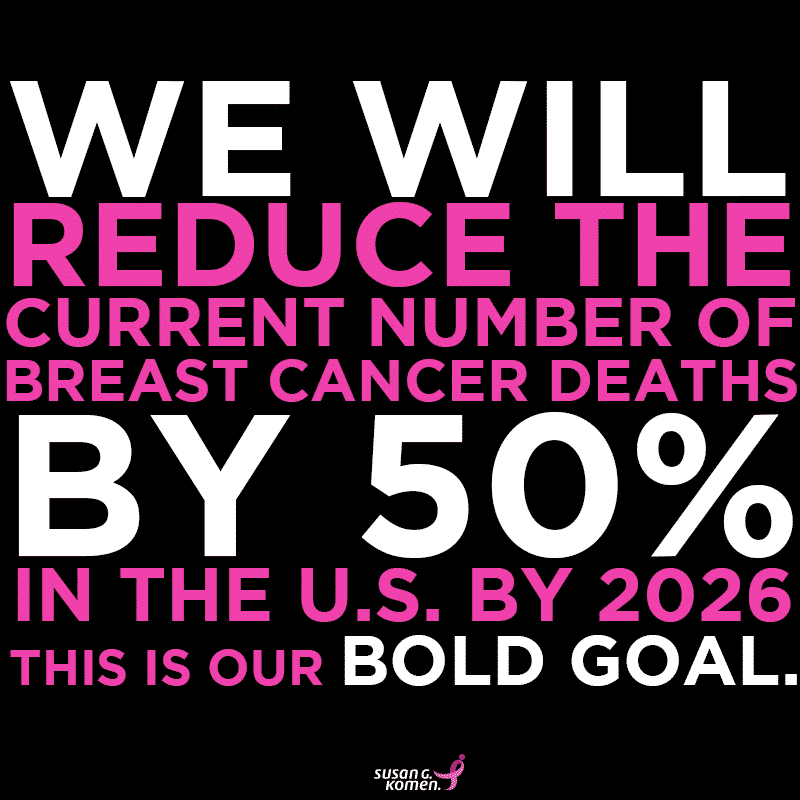 Susan G. Komen®’s mission is to save lives by meeting the most critical needs in our communities and investing in breakthrough research to prevent and cure breast cancer. The Susan G. Komen Race for the Cure® Series is the world’s largest and most successful education and fundraising event for the disease ever created. The series of 5K runs and walks all across the country help raise significant funds, as well as awareness for the breast cancer movement. They celebrate breast cancer survivorship and honors those who have lost their battle with the disease. It doesn’t matter what your age or fitness level is, because The Komen Race Series welcomes everyone, from walkers to elite runners. Can’t Race? Make a Donation! If you can’t make the race for any reason, you can still help by making a donation at Valpak Goes Pink. The reason Susan G. Komen and Race for the Cure is important to me is that I’ve been affected by this horrible disease. 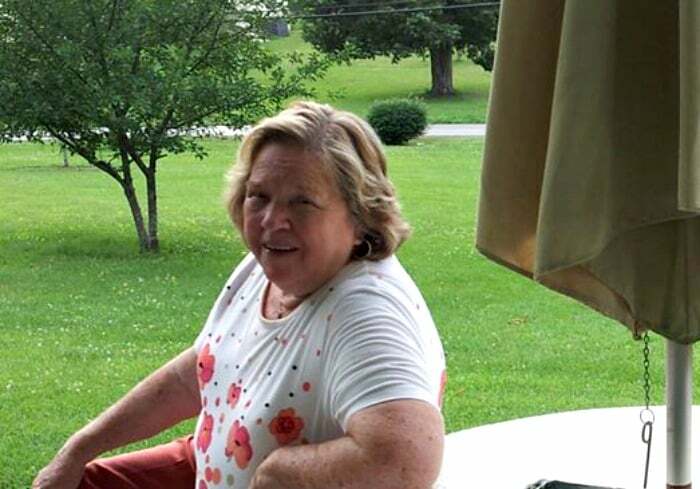 My mother-in-law is a breast cancer survivor, and my great-grandmother lost her battle with the disease. And sadly, I’ve known many other women who have battled this disease, some have lost, and some have won. Also, I know the chances of developing this disease myself is great… the biggest risk factors are being a woman and getting older. It’s also the most common cancer among women in the U.S. I look forward to the day when this disease will be a thing of the past. 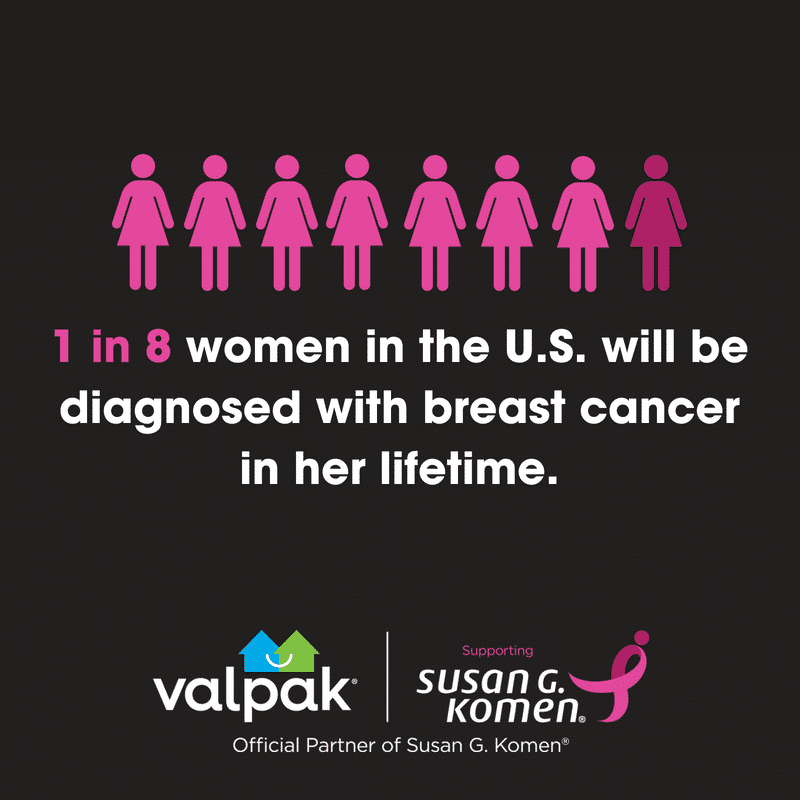 Partnerships like Susan G. Komen and Valpak are working to make that a reality. Their BOLD GOAL of reducing the current number of deaths by 50% gives me hope. The pink envelope will introduce a related sweepstakes, inviting consumers to nominate a hero who has taken action in the fight against breast cancer. Throughout the month of October, Valpak will share the submitted stories and ultimately 25 lucky winners will each receive a set of pink KitchenAid appliances in support of Cook for the Cure®. The set includes a stand mixer, blender, 2-speed hand blender and a 5-speed hand mixer with a total retail value of over $800. The nationwide October Valpak envelope will also feature a special surprise for 500 lucky recipients, who will instantly win an immersion blender courtesy of KitchenAid by looking through their pink Valpak envelopes and finding a die-cut certificate shaped like an immersion blender.